* Battery-powered Sampler does not include a battery pack or power module, which must be ordered separately. ** Battery replacement requires two batteries, part no. 700285. TFIA 110-125 Volts AC/DC, 50-60 Hz Basic model best seller! TFIA-2 220-240 Volts AC/DC, 50-60 Hz Basic model best seller! When normal currents are not available 24 Volts DC models are ideal for remote field use. Other special model High Volume Air Samplers also available. Gasoline and diesel generators available for TFIA (110-125 V) and TFIA-2 ( 220-230 ) Series High Volume Air Samplers. Request details. Portable Air Sampler for indoor and outdoor sampling for all types of airborne particulates including environmental pollutants, nuclear and biohazards, industrial, governmental and military tests and studies, mine air hazards, factory dusts, chemical, radiological and toxicological analyses, as well as innumerable other types of research, quality control and testing applications. Large volumes of air are drawn through a filter by a high-speed rotary motor. Particulate matter in the air collects on various types and sizes of filter papers including Glass Fiber Filter Media. Universal motor, Pump, Variable Orifice Flowmeter calibrated 0-70 CFM or 0-2 CMM; 4" ( 10.16 cm ) diameter Filter Holder Assembly, Filter Support Rod and Stainless Steel Mesh Adapter, carrying handle, on/off current toggle switch, 8 foot ( 38 cm ) grounded cordset. Filters can be analyzed gravimetrically, by weighing, taring, ashing, spectrography, atomic absorption, comparator, microscopic count, chromatography, atomic colorimetric assay, and gamma­ray spectroscopy, x-ray fluorscopy and neutron ac­tivation etc., to identify pollutants and measure their concentrations. 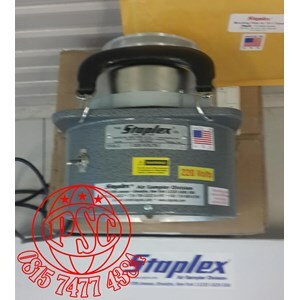 The Staplex SH4 4" Diameter Filter Holder Assembly, is equipped with filter support rod to be used as back support for Staplex TFA2133 filters. In addition. when using Staplex TFA41 Filter Paper and Staplex TFAGF41 Glass Fiber Filters, a special 4 " Diameter Stainless Steel Screen is required ( included ). Can be used indoors or outdoors. 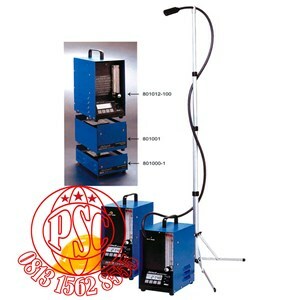 for mobile or fixed position operation either horizontally or vertically. Also available is a convenient Staplex TR-1 Tripod moun­ting. When required for protracted periods outdoors a special outdoor enclosed shelter in Aluminum ( SAM ) or Wooden ( SWM ) is available. TFIA series models can be operated continuously when using TFA810 and TFAGF810 8" x10" filters continuously, with filters checked and changed as need, based on particulate saturation. No lubrication of any motor parts is required. Motor brushes should be check after every 600 hours of usage and changed as needed. Changing of brushes is recommended for every 800 - 1,000 hours of usage.